Samsung is now rolling out the June security patch for its latest and greatest premium tablet, the Galaxy Tab S3. The company has rolled out said firmware update for both the cellular and Wi-Fi only models of the tablet. It’s making the jump up from the May security patch which was released for the tablet several weeks ago. Unveiled at the Mobile World Congress 2017 earlier this year, the Galaxy Tab S3 features a 9.7-inch QXGA 2048×1536 pixel display with a Qualcomm Snapdragon 820 processor under the hood. It also features 4GB of RAM and 32GB of storage. The tablet has a 13-megapixel rear and 5-megapixel front camera, a 6,000mAh battery with Fast Charging, fingerprint sensor and AKG’s audio technology. It runs Android 7.0 Nougat out of the box. Firmware version T820XXU1AQF3 is now being rolled out for the Galaxy Tab S3 in Europe. It weighs in at 300MB and brings stability and performance improvements alongside the June security patch. 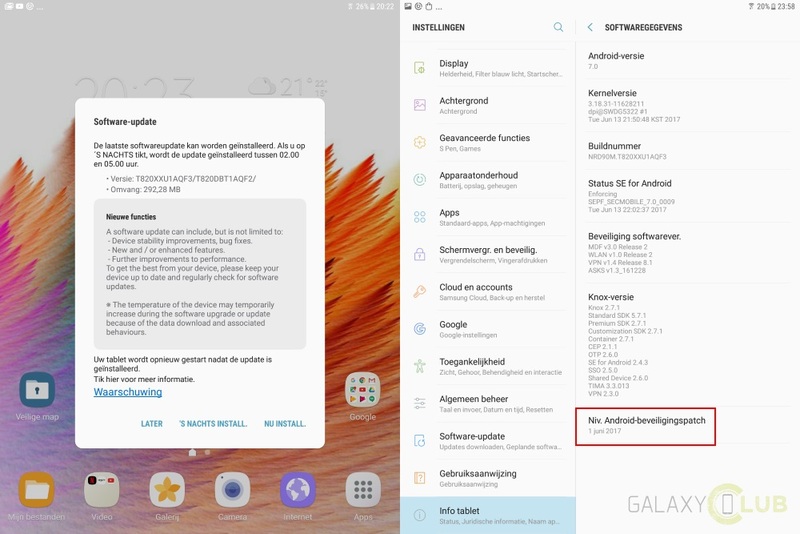 The latest security patch features patches for 96 vulnerabilities in Android OS as well as 23 vulnerabilities in Samsung’s own software. It shouldn’t be long before this update goes live in all markets across Europe where this tablet is available. Users will receive a notification on their device when the update is available. Received it yesterday in Germany. Hope they will continue bringing monthly updates!